I thought it'd be more useful to link the deal to the review instead since you need to download this from your phone. PS: this app is just under 50MB and maps can weigh up to 300MB each so do get a WiFi connection before your start downloading! Thanks for this, been looking for a decent Free satNav app. does this work without data connection charges ?? Quotes are from NavFree site. Navfree uses map data from OpenStreetMap(OSM), often referred to as the Wikipedia of maps, which allows us to provide you with full GPS navigation at no cost to you. No monthly fees or Annual charges. Maps are stored on your device. Receive free updates of the map data for life. 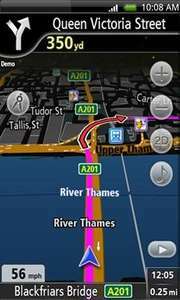 Navfree is powered by Navmii, a top selling premium navigation software application. Shame... It works fine here, although it's hogging most of the little space I had left on my good old Desire (ah that Nexus Prime won't come fast enough!). Did you download the maps? If not, head to the shop in the menu and get the UK & ROI map to start with. Yup, that's the whole point, this one is all on your memory card so you can use it abroad too. And if you're limited in the amount of data you can download every month, that would probably help too. i used that in HTC desire and work great. Im using a Samsung Galaxy s2.. Damn. Just like kaiyuatan! There might be a compatibility problem there. It's a really good app, I see it even has the name of the buildings where I work whereas Google Maps just has a grey patch representing the whole campus. This is a preview version though so hopefully this will be fixed soon. It's worth checking it once in a while on the market! [Edit] Ah you just beat me to it! Thanks for this - installed on my San Fran with Ginger StirFry. Maps are in the online store if anyone is looking for them. Are US maps available anywhere for this? Only see uk options to, would be interested in knowing where to get other countries etc.. Sadly it seems to be UK & ROI only so far, although US maps are apparently coming soon. I can't see why European maps wouldn't come soon either given that they're already available for Apple and Nokia devices. I'm going to edit the title to reflect that. Brilliant app otherwise, the maps are so much more precise than Google's and even have pedestrian pathways and building names! The interface is very neat too, really happy with it. Unlike Google Maps, it doesn't have satellite view or StreetView but they have announced live traffic updates as a coming feature. @thepearce thanks a lot for the QR barcodes! Are safety cameras on it or can they be put on? wow, thanks for this, I'll be trying it on my andypad when i receive it today, hope it works. Does anyone know if htc wildfire is android 2.2 or 2.3 ? Use the Android 2.3 link for Galaxy S2. Quite good - but not of any use for me since I get data connection/Google Maps for all my UK trips! Wish we could get other maps. sorry new to all thisDoes anyone know if htc wildfire is android 2.2 or … sorry new to all thisDoes anyone know if htc wildfire is android 2.2 or 2.3 ? Hi.. Don't have the wildfire myself but would suggest trying the 2.2 version, if it doesnt work go for the other.. Does the app and all maps get installed to the SD? Is any space taken up at all on the internal storage? I have the good old HTC Desire and internal space is always an issue on this phone. Also, will it work on Android Tablet? Works great on my Xoom. Make sure you download the 2.3 version link provided by Kiddson. it should be work! Also, is that any way we could get the Europe or world map for this? Hi.. Don't have the wildfire myself but would suggest trying the 2.2 … Hi.. Don't have the wildfire myself but would suggest trying the 2.2 version, if it doesnt work go for the other..
Make sure you download the 2.3 version link provided by Kiddson. it … Make sure you download the 2.3 version link provided by Kiddson. it should be work!Also, is that any way we could get the Europe or world map for this?